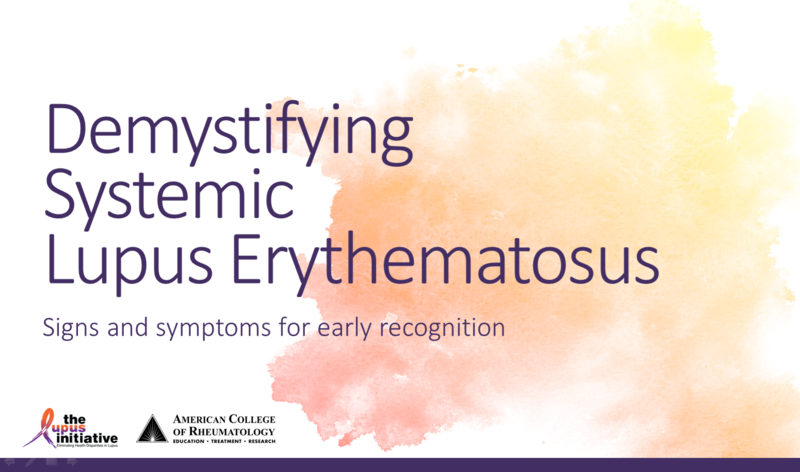 Identify the presenting signs and symptoms of lupus. Refer a suspected case of lupus to a rheumatologist. Initiate a work-up for lupus. Understand lupus epidemiology, health disparities, disease characteristics and genetics. Since its inception in 2015, over 900 non-rheumatologist providers have attended seminars led by rheumatology fellows from 11 rheumatology programs in the United States and Canada. Data presented at the 2015 ACR/ARHP Annual Meeting indicated rheumatology fellows are highly effective educators in improving the recognition of lupus by frontline healthcare providers. The 2015 trends reflected below continued in 2016/2017. In addition, participating fellows gained required competencies under the Accreditation Council for Graduate Medical Education, and local providers that attended a seminar were able to build stronger linkages to specialty care. Step 1: Download the presentation. Step 2: Review the assessment tools. The project uses a pre/post seminar assessment to measure changes in knowledge and confidence. These questions can be adapted to the needs of your community or can be used to take an initial knowledge assessment before implementing the project. Step 3: Communicate with the ACR. Please let us know if you intend to implement the project. We would like to support your efforts and to gather data at the end. Contact us here. Step 4: Recruit your educators. Project participation can help your fellows develop core competencies required by the Accreditation Council for Graduate Medical Education (ACGME). Not a program director? Junior faculty, attendings, and general internists can also serve as lupus educators. Step 5: Give an orientation. Once you’ve selected your educators, get them oriented to the project, logistics, and the goals by having them review the orientation, presentation, and assessment tools. Step 6: Promote and schedule seminars. Contact department heads, community health centers in your area, or local medical societies to schedule the seminar. Reach out to providers that currently refer to your clinic or those in your catchment area. If you work in a hospital, contact your provider relations office to help. Step 7: Deliver seminars and collect assessments. Create attendee packets with the assessments. The pilot project used a unique identifier to make sure the pre and post assessments were matched for data entry, but if you see fit, you can ask for participant names and other contact information. Step 9: Enter and analyze data. See how knowledge and confidence changed from the pre to post test. Local foundations or other organizations may offer relevant grant opportunities to implement the projects. If collecting data, you may need to contact your local Institutional Review Board to review the project early in the process. If your organization is a Continuing Medical Education provider, contact them early to get CME accreditation to boost participation. If you plan on sending the online version of the assessment 4-6 weeks later to assess knowledge retention, consider how you can continue to engage with participants during that period — consider sending an email with quick lupus facts. This is a low cost, low effort project to help improve lupus knowledge and confidence among frontline providers in your community. It is an opportunity to improve the speed and accuracy of referrals to rheumatology for lupus assessment. This can help improve patient care while improving communication between providers. Contact the Lupus Initiative for more information.